Learn more about proposed revisions to the WaterSense labeled homes program. Spruce up your sprinklers with four simple steps: inspect, connect, direct, and select. Splash into water and money savings with our latest issue. Take a look at our new water champions who help Americans save water for future generations! Take steps each day to save water and protect the environment by choosing WaterSense labeled products in your home, yard, and business. Learn more about WaterSense and how we can all get more by using less. 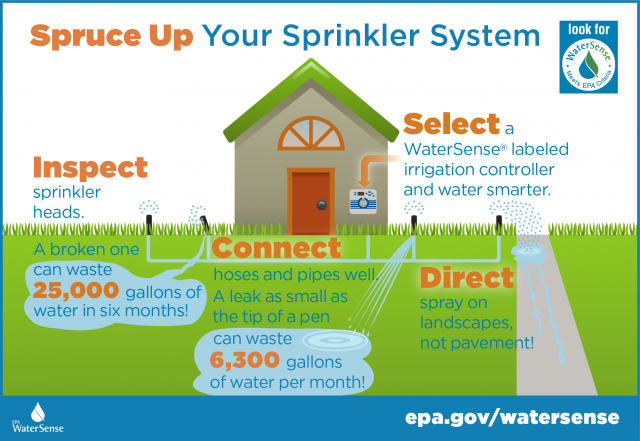 Broken sprinkler heads can waste as much as 25,000 gallons of water in six months! Inspect. Connect. Direct. Select.